The more you lose yourself in the wonderful world of the Christmas carols, the deeper you want to dive into them. 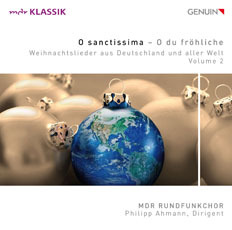 It was like this with the MDR Radio Choir, and we can be happy that the much-loved GENUIN CD of this top ensemble and its leader, Philipp Ahmann, will be followed by a second. What treasures are there to discover: an endless variety of songs with a broad range of expression and mood, sung lovingly and with the highest level of musical skill! Carols such as "Macht hoch die Tür" ("Lift up your heads") or "O du fröhliche" ("Oh how joyful") stand side by side along treasures from England, France, Japan and many countries. At the latest from the second verse on you will begin to hum along.